It’s not something you should watch by yourself, Klunkerz. The independently written and produced DVD by fat-tire aficionado Billy Savage recounts mountain biking’s California days in the ’70’s and takes you there so vividly — with tons of footage, still photos, and interviews with a bunch of guys (and a couple of girls) who drank beer, smoked pot and then got on their damned bikes — that you and your friends will want to join in. Wendell, Karen, Ian, Paul, Andrew and I didn’t light up, but we did crack a few beers in my living room one Friday night as we gathered to watch Savage’s flick. 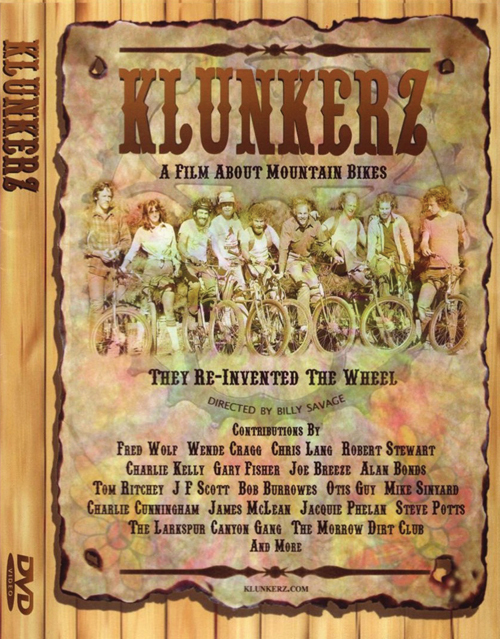 Finally on disk, Klunkerz has sold out theatres, won awards, and no doubt brought tears to a few MTBer’s eyes as it screened in the film, bike and sport circuits. Filmmaker Savage demonstrates a genuine knowledge of the bikes, and rapport with the people who first dragged their heavy ’40’s and ’50’s-era Schwinns up a San Francisco-area mountain for kicks. Not only do many of the Mount Tamalpais riders — Joe Breeze, Gary Fisher, Tom Ritchey et al. — do screen time, but they share their stories and video footage with him in a way that feels trusted and intimate. Not just talking heads, the film lingers on the stuff us riders love: the bikes, the parties and the trails that made Marin County famous. You actually see the 1.8 miles of fire road that the riders ate up (or ate them up, as injuries were frequent), the grease smoke coming off the hubs, and the keg-parties that fuelled the whole thing. The editing is so sharp that the riders practically finish each others’ sentences. You get a real sense of their excitement and you’re reminded that at mountain biking’s heart, the message is universal: riding a bike is super fun, and you ought to try it. Our gang really picked up on that. In discussion afterwards, Ian was stoked to see how how fun — rather than equipment — created the scene. Wendell liked seeing the riders’ passion turn into something huge, and Paul (an MTB Hall-of-Famer himself) was impressed by the amount of history that the film dug up that he hadn’t heard before. And I felt affirmed by how writers and photographers like Wende Cragg, Jacquie Phelan and Dogtown’s Ray Flores can play an important part in recording a movement and spreading the word. Visit the Klunkerz web site at www.klunkerz.com to chat with Savage and order your own copy. For more on the history, I recommend the Mountain Bike Hall of Fame web site. Published in the May/June 2008 Momentum Magazine.